Each member group of the Conservation Council ACT Region is invited to make a quilt block for the Conservation Quilt. The blocks will be made into a quilt to celebrate conservation in the ACT and hang in the offices of the Council. The quilt will be launched in mid 2015 in conjunction with World Environment Day. We are confident most groups will have a quilter in their ranks. 33 cm by 43 cm or 13 inches by 17 inches. Each block will be trimmed back by about 3 centimetres (an inch) so do not put key details at the edges of the block. Note: any images must be free from copyright or the copyright must be invested in the organisation or individual submitting the block. For further information please contact Larry O’Loughlin at the Conservation Council office [email protected] or Christine Goonrey [email protected] Be there or be unsquared. No, this isn’t the beginning of a cheesy joke – it’s the start of a truly inspiring story. We, Canberrans stand in solidarity with the Maules Creek community in the fight against Whitehaven Coal’s damaging coal expansion plans. We have taken this action to call out the ACT Government and its continued investment in Whitehaven Coal and another 70 of the worst fossil fuel companies on the planet. It’s simply not right for a Government that professes to champion climate leadership to also invest in dangerous coal companies. The ACT Government has a decision to make – divest from fossil fuel companies like Whitehaven or prepare to see more community action like today’s. You can add you voice by signing our petition for a Fossil Free ACT today. To be honest, none of us wanted to spend our Sunday doing this. We’d rather be at home with family and friends. But when companies purely motivated by profit can trash endangered forest, ruin cultural sites and further risk the climate, you can’t sit idly by. You have to do something. 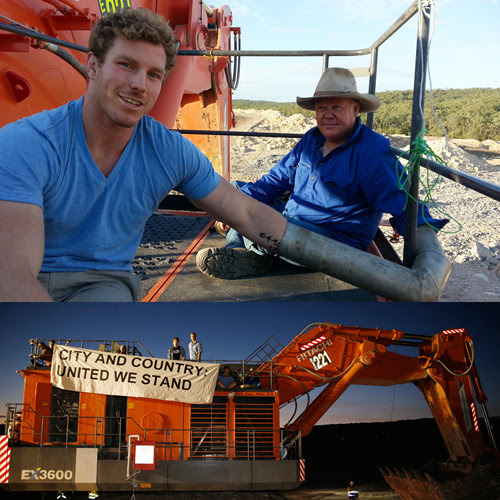 You can do something by signing this petition for a Fossil Free ACT and sharing this story on Facebook. Together let’s send Whitehaven and the ACT Government a powerful message! P.S. Click here to tell ACT Treasure Andrew Barr to divest from Whitehaven today! In her last report from the World Parks Congress Ishbel Cullen has looked at urban protected areas, an issue which has particular relevance to the ACT where most residents are within a kilometre of a nature reserve. For many, ‘protected areas’ would invoke visions of distant wilderness, of places far away from human activity. While many large tracts of protected natural areas are located in rural and remote areas, this perception overlooks the significance of protected areas in urban areas. The International Union for the Conservation of Nature (IUCN), the organisers of the World Parks Congress, has recently published a report to highlight the importance of urban protected areas. The lead author of the IUCN report, Dr Ted Trzyna, ran a workshop at the Congress on urban protected areas, with participants from cities around the world. He stressed the important ecosystem services that protected areas provide our cities, such as clean water, reducing the urban heat island effect and maintaining resilience from natural disasters. He then outlined that protected areas in and around cities are different from other protected areas in two core ways. Firstly, urban protected areas are accessible to large number of visitors from diverse backgrounds. Secondly, urban protected areas have an important political role in building urban constituencies that value conservation. By researching urban protected areas around the world, Dr Trzyna and his team have collected some important observations and lessons. Not surprisingly, urban areas face the most pressure from development, pollution and high levels of use. However, there are also many positive stories to share. In Hong Kong, a remarkable 40% of land area is in protected parklands. In Taipei, Yangmingshan National Park has an extraordinary volunteering culture, with over 700,000 hours of volunteer work dedicated per year. In San Francisco, the Parks Conservancy NGO collaborates with the Golden Gate National Parks to delivery extensive education programs, with a focus on climate change education. Instead of talking about climate change politics or predictions, they are highlighting changes happening in the park today to make climate change real and accessible. Through their research, the group has identified elements needed for successful urban protected areas that realize their full potential. Firstly, history demonstrates that early decisive action to dedicate protected areas before urban sprawl advances is crucial to having any protected areas in the first place. Strong planning measures should be implemented for areas surrounding protected areas to manage urban threats to biodiversity. Citizen support and attachment to urban protected areas must be secured and cultivated through encouraging visitation, even if this means higher levels of human impacts. Educational opportunities of urban protected areas are immense and adequate resourcing is required to realize this potential. The benefits of urban protected areas seem clear to those of us who know and love them. Here in Canberra, the direct benefits are enjoyed everyday when you look up to an undisturbed skyline or see five different bird species on your ride home. The indirect benefit of urban protected areas may be less obvious, but even more important: inspiring a broader conservation and sustainability ethic among large urban populations. The World Parks Congress raised many issues and our reporter Ishbel Cullen has summarised one discussion which strikes a chord across this planet: the impact of invasive species on local species and biodiversity. A love of the plants and animals of this world unites everyone attending the World Parks Congress. However, this love does not extend to species that have spread beyond their original geographic location to foreign destinations, where they behave recklessly and create havoc for the locals. From raccoons in Poland, eucalypts in California and cats just about everywhere, invasive species are a major threat to biodiversity around the world. The next speaker was passionate about a slightly broader theme, islands and invasive species. With 70% of known extinctions, islands are high-risk areas for losing species, however, islands also present unique opportunities for conservation. The representative from Island Conservation stressed the strategic importance of targeted invasive species eradication programs on islands. To date, there have been more than 1300 invasive species eradication attempts globally and 907 of them have been successful. The strength of biosecurity regimes often determines eradication outcomes, meaning island military bases often have the best results. Many of the successful eradication programs have lead to dramatic and immediate changes. On Palmyra Atoll in the northern Pacific Ocean rodents were eradicated in 2011, resulting in a large increase in new native tree seedlings because the rodents aren’t eating all the native seeds anymore. On San Nicola in the Channel Islands of California, cats were eradicated in 2010 and now the local Island Night Lizard has achieved a rare feat, being removed from the threatened species list because of population recovery. The next speaker in the session was from Brazil and discussed the difficulty of invasive native species, a topic that resonated with many in the room. In Brazil, Tamarin monkeys are both endangered in some areas and invasive in other areas. This raises difficult questions for how to manage the species within one jurisdiction, under the same threatened species laws, when having to kill a species in one area and protect it in another area of the same country. The diversity of speakers and members of the audience demonstrated that managing invasive species is truly a universal challenge. When ecosystems are disturbed and the will of species to live, compete and reproduce goes unchecked, this force of life becomes a force of destruction. The real question: how to manage the most invasive species of all? The Conservation Council’s volunteer ace reporter Ishbel Cullen is also a volunteer at the World Parks Congress and she spent most of a day at the ‘Financing Conservation Pavilion’ which helped inspire this piece. Biodiversity conservation requires money. And guess what, it’s not getting enough at the moment. Recent research by WWF and Credit Suisse has shown that investment in biodiversity conservation needs to be around $200- $300 billion globally per year, 20-30 times the current level. So where will the money come from? This week at the World Parks Congress experts from around the world have been discussing this dilemma. Recognition of ‘natural capital’ has been raised repeatedly at the Congress as part of the solution to this funding problem. Natural capital is a new twist on the old term ‘ecosystem services’, which includes all the resources and functions that our environment provides for free. The natural capital concept involves putting a price on the value of ecosystem services, or inversely, the cost of damaging such services. This could help address the fundamental problem of environmental externalities in the current economic system and generate funds for conservation through Payment for Ecosystem Services (PES). In a warming world, environmental risk and the importance of natural capital can only become increasingly apparent. Let’s hope this translates into more cash for conservation. Conservation Council ace reporter Ishbel Cullen, an ANU student and volunteer with 350.org, is attending the IUCN World Parks Congress (WPC) in Sydney and providing reports for us. The WPC is a landmark global forum on protected areas held every ten years with over 5,000 people participating this year. It is the world’s most influential gathering of people involved in protected area governance, and sets a global agenda for the following decade. Ishbel has attended the conference as a volunteer and also as part of a group called the Young People’s Media Coalition (YPMC). The YPMC aims to create and distribute media pieces that provide a youth perspective on the conference. Here is her first report. The World Parks Congress, happening for the next week in Sydney, is a once-in-a-decade event. The last World Parks Congress was held in South Africa in 2004 and opened by the late Nelson Mandela. Organized by the International Union for the Conservation of Nature (IUCN), the World Parks Congress is the flagship global forum on protected areas, which includes all terrestrial and marine areas legally designated for the conservation of nature. The Congress brings together park rangers, conservation experts, government officials and concerned citizens to foster a shared understanding of the challenges and opportunities facing the global protected area network. The opening plenary, held on Thursday, was a balancing act between applauding achievements and acknowledging some grave realities. However, the emphasis for this session was definitely on the former, creating a positive and self-congratulatory atmosphere. The former Director General of the IUCN, Achim Steiner, outlined the growth in the protected area network over the past decade, which now includes an area equivalent to the size of Africa. There was a live video call to an exuberant marine biologist under water, showing us around the Great Barrier Reef. The Chinese vice minister for Forestry explained that 18% of Chinese territory is in protected areas and there ambitious plans for the future. We even heard the Foreign Minister Julie Bishop waxing lyrical about her heartfelt commitment to Australia’s natural heritage. The sentiment from this Australian Government Minister would have made many in the audience feel uncomfortable, given the federal governments many assaults on Australia’s environment were not mentioned. The governments climate change policy was barely alluded to, which was particularly awkward given the focus on the Oceania, with a number of Pacific head of states giving talks about the impacts of sea-level rise. The natural world is an eternal source of inspiration for so many of us and the protected area network is a huge achievement that the global conservation movement should celebrate. However, I hope to see the seriousness of the threats to biodiversity, especially the sleeping giant of climate change, openly confronted at the WPC in the coming days. Luckily climate change is on the agenda, unlike another notable gathering happening in Brisbane this weekend. Conservation Council ace reporter Ishbel Cullen, ANU student and volunteer with 350.org, is attending the IUCN World Parks Congress (WPC) in Sydney and providing reports for us. The WPC is a landmark global forum on protected areas held every ten years with over 5,000 people participating this year. It is the world’s most influential gathering of people involved in protected area governance, and sets a global agenda for the following decade. Ishbel is attending as a volunteer and as part of the Young People’s Media Coalition (YPMC) which aims to create and distribute media pieces that provide a youth perspective. Here is Ishbel’s first report and you can provide comments below. The sentiment from this Australian Government Minister would have made many in the audience feel uncomfortable, given the federal government’s many assaults on Australia’s environment were not mentioned. The government’s climate change policy was barely alluded to, which was particularly awkward given the focus on the Oceania, with a number of Pacific head of states giving talks about the impacts of sea-level rise. Late news: Conservation Council was told on morning of proposed debate (30 October 2014) that consideration of the Nature Conservation Bill would be delayed to November sitting. While there seemed to be general agreement on the legislation there were matters to be sorted out between ACT Government directorates. The Conservation Council was pleased delay was envisaged to be only four weeks given the Review discussion paper was dated nearly four years earlier as November 2010. After many years in development the Nature Conservation Bill 2014 will be considered by the ACT Legislative Assembly on Thursday 30 October 2014. The Conservation Council welcomes the debate and has made participated in a range of processes with input from several member groups including Friends of Grasslands, Canberra Ornithologists Group, National Parks Association and the Environmental Defender’s Office. The Conservation Council particularly welcomes the changes which give effect to an ecosystem or landscape approach to biodiversity. This means looking not just at individual species or ecological communities or managing areas of biodiversity within reserves, but rather the broader landscape and also focussing on addressing actual biodiversity outcomes. The Conservation Council has a number of issues on how the new arrangements introduced through the Planning and Development (Bilateral Agreement) Amendment Bill 2014 will deliver intended biodiversity outcomes. While the Conservation Council had previously proposed that biodiversity offset principles, governance arrangements and conditions be incorporated into the Nature Conservation Act (our recommendation 23) we now suggest that the issues are significant enough to warrant separate consideration either via amendments to the new Nature Conservation Act 2014 once passed or the Planning and Development Act 2007, rather than via consequential amendments to the Nature Conservation Bill 2014. The Conservation Council welcomes the strengthening of the role of the Conservator and requirement for the Conservator to have suitable qualifications and experience. It remains a high priority for the Conservation Council that the position of Conservator be a dedicated position. While it might be unusual for legislation to specify this the Conservation Council believes that if it is not in the legislation then the Government should make a formal commitment to create a dedicated position. The PriceWaterHouseCoopers Report on the role of the Conservator (page 2) recommended Creation of Dedicated Position of Conservator. Our comments as provided to Government and all parties in the Legislative Assembly are attached. If you want to watch the ACT Legislative Assembly (electronically) as it happens go here. If you want to watch it later use the Daily on Demand service. You then have fast-forward and replay options.